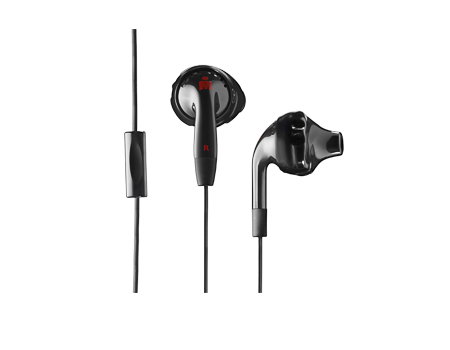 yurbuds Ironman Inspire Talk Performance Fit Sport Earbuds are perfect for working out. Their unique designs protect them from both sweat and water. These in-ear buds are sweat/water-resistant, allow for ambient noise awareness, and are guaranteed never to hurt or fall out. Their ergonomic fit delivers consistent, premium sound quality produced by 15mm drivers. Featuring a one-button microphone system with track and call control, yurbuds Inspire Talk earbuds are compatible with iPhone, Android, and BlackBerry devices. TWISTLOCK™ TECHNOLOGY: Guaranteed to never fall out. MICROPHONE WITH ONE-BUTTON CONTROL: Compatible with most smartphones (iPhone, Android, BlackBerry). FLEXSOFT™ COMFORT FIT: Ergonomically designed to avoid nerve-rich areas of the ear. SWEAT + WATER RESISTANCE: Designed for active use. AMBIENT NOISE AWARNESS: Designed to allow more ambient noise than most other earphones at the same volume levels. EXCEPTIONAL SOUND: Clinically proven acoustics.